We slept in late today! We've been up late every night and clearly this was the morning to catch up on sleep. We had a 4 1/2 hour drive to Niagara Falls so it wasn't a big day for driving. But it still would have been nice to get there earlier. We arrived in the late afternoon and then drove to the Falls to check it out. I had already bought a package online that included The Maid of the Mist and Cave of the Winds that we were planning to do the next day. 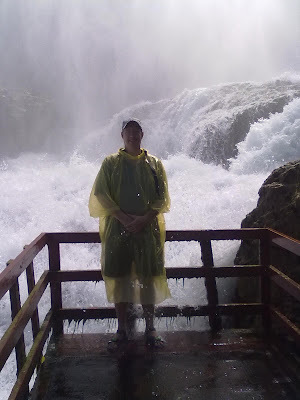 I have to share this experience and advice people who may be planning to visit Niagara Falls. We bought a package online and the tickets printed said to redeem at a "Visitor Center". We found out that there are Visitor Centers all over Niagara Falls, In fact, they even have them an hour before you even get in the city. So we go into the Visitor Center and were promptly told that there was a different Visitor Center where we needed to redeem these. Or they said we could redeem them AT Niagara Falls. OK. Here's the problem. This guy at the Visitor Center told us that the package that we bought was horrible and that they were so "cheap" because we'd have to stand longer in line and pay a "ton" for parking. He even told me that we could sell the tickets for like $28 (I paid $33) and then come back and buy his tour tickets at The Visitor Center for $84 a piece. His tickets tour would include a ride to the Falls, a guide and shorter lines. I'm like you want me to sell my tickets AT A LOSS - come back and pay you $50 more a ticket ($250 more for the family) for a ride and a guide? I may have been a dumb tourist but this didn't sound logical. I politely left and we headed to the falls. Here's the deal people - Do NOT go to this Visitor Center, unless you want a map. They have them everywhere, there are many, many of them. Clearly they pay for them all with their super high fees. Please just go to the falls, find parking on Goat Island, pay the $10 for the whole day. Then buy the Discovery Package. You'll get The Maid of Mist boat ride, the Cave of the Winds, free trolley rides all day, a Niagara movie a Discovery Center place, and the Aquarium for $33. Less for kids. It's easy to find and not a hassle at all. It's totally worth it, trust me!! Just walking along the river is an extraordinary sight. The river is so strong and the rapids are powerful yet beautiful. It's always nice to get a family photo. Rarely can I get everyone together! The background is gorgeous but I think there was a huge spray of mist as the picture was shot. After all, there was a waterfall right behind us! My favorite was the Cave of the Winds. I guess there used to be a cavern behind the falls that you could walk under. They cavern is no longer there but you can still walk right up to the falls. This is indescribable. It was the most amazing thing I've ever seen. Seeing the falls from the top is a magnificent sight but to be right under it is a completely different perspective. I couldn't possibly take a picture that would be even close to showing you how it was. I chose this one with my husband as you can see the huge waves behind him. I could have stood there for an hour. I just kept thinking about Gods power and his wonderful creations. I took this from the Maid of the Mist. The boat takes you amazingly close to the falls. I was on the wrong side of the boat so it was hard to get a good photo. So here is a photo of everyone else trying to get photos of the falls. The only thing I didn't like about The Maid of the Mist was that there were too many people on the boat. We were packed way too closely and it was hard to even find a place along the railing to hold onto. I would recommend if you go, go in the morning and do this tour first before the crowds come. After Maid of the Mist, we got to go up to the Gorge which was a walking trail right under the falls. This one got you really, really wet! I opted to sit out on this one. Here is my husband and Danielle with their awesome waterproof ponchos after getting doused from the falls. We didn't go into Canada as we were only here for a day and a half. Plus, we didn't get passports. I've heard that the view is better from Canada. Here is our shot of Canada across the river. We all waved to Canada! At 9 they turn the lights on and they are just beautiful! Then there is a great fireworks show as well. We loved to people watch. There were people from all around the world. My youngest son, Jory, asked at one point, "Mom, what's with all the people and the costumes?" There were Amish and many, many other cultures that were dressed different. All over you could hear different languages. Jory wasn't familiar with passports and why they are needed. So I explained that governments need them so they know who is coming into their country. He wanted to know why people couldn't just go where ever they wanted to. He asked if God wanted all these countries to have passports. I told him that God's purpose was to have a unified world with no borders and passports and boundaries. We had learned about Pangaea at the Aquarium where the continents were all unified and stuck together millions of years ago. After explaining that the governments all feel they need to control their borders and know who is coming and going he said the most awesome thing. He said, "Mom, I liked Pangaea better." He is so right. How awesome would it be if we didn't need passports or have borders? Do you think we'll ever have a world like that?